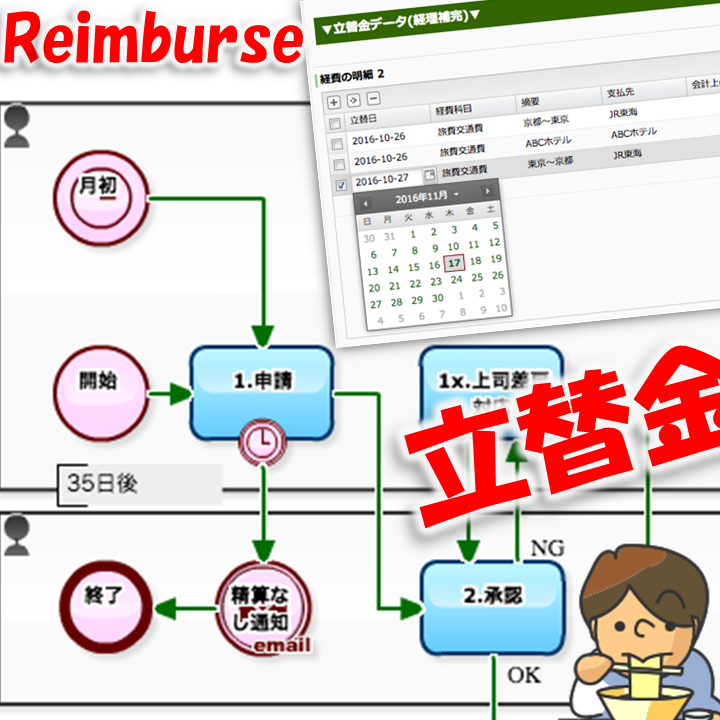 "It's so troublesome to enter billing data..."
Logs such as bank deposits and withdrawals and card payments have become "automatic journalizing", and "accounting input work" became quite easier compared to before. However, in terms of "sales" in particular, it is too late to wait for the timing of "deposit". 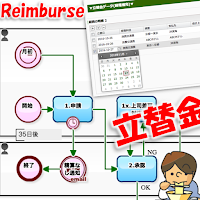 After all, it is desirable to record it as "sales as accounts receivable" at the time of "invoice" issuance... Rather, it's a must. Incidentally, on the contrary, there are cases where cannot include in "sales" at the time of issuing "Invoice" (even at the time of "deposit"). The creation method and creation timing of so-called "transfer slips" (transfer records) varies depending not only on the type of industry but also on company policy. Even so, the work itself should certainly be "automated". The import file is automatically generated. 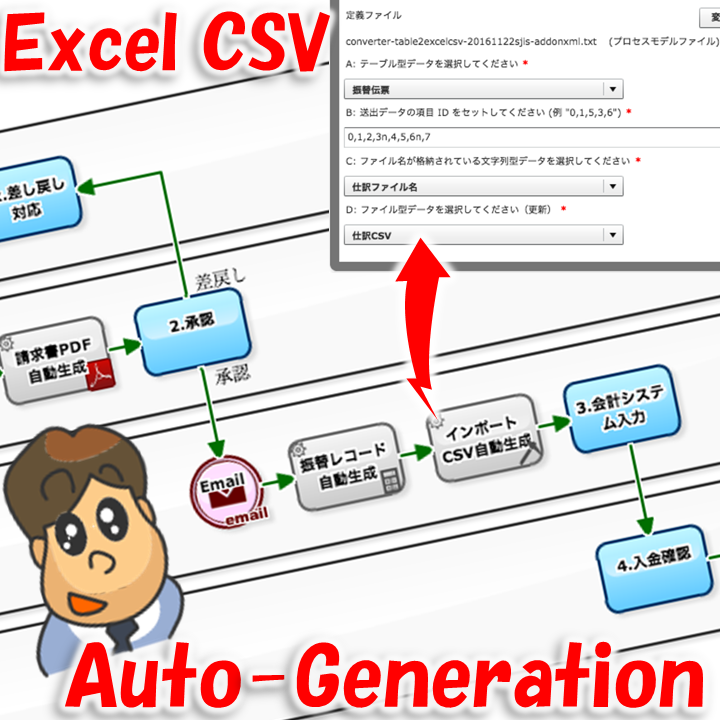 Accounting staff can finish "input work" by only uploading the automatically generated Excel-CSV file to the accounting system. "Because of the corporate card, it is difficult to grasp the entire expenses"
Business process improvement will reduce "wasteful work" and "time-consuming procedures". However, along with that, "checking by human" tends to be inadequate. However, there is often a trade-off relationship between "labor saving and unmanning" and "strengthening the check system." After all, must seek "compromise to suit each company". 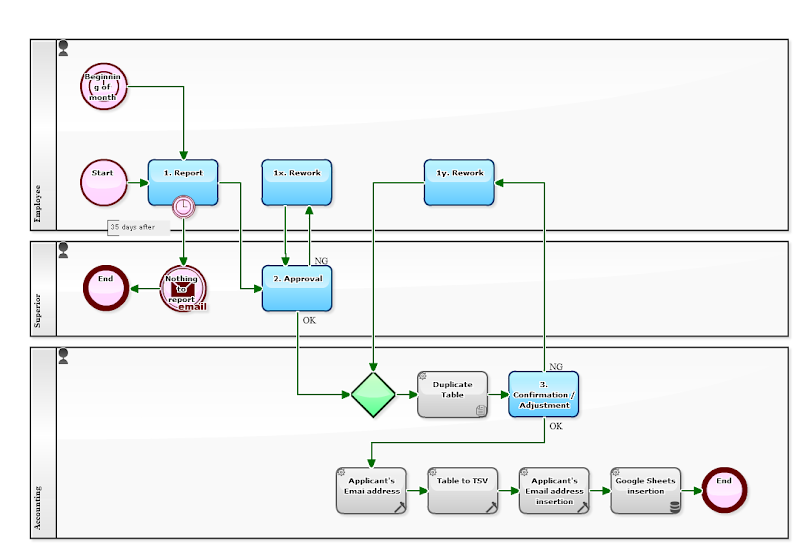 The Expense reimbursement flow below is a monthly application type business flow that mainly aiming "reimbursing out-of-pocket expense". In this example, it is devised so that approval can be obtained for expenses which do not require settlement as reimbursable out-of-pocket costs at the same time. This is an idea that it will eliminate advance approval about "payment with credit card" and "travel expenses receiving temporary payment". The applicant himself will have the effect of not only "saving labor" in one application, but also "becoming aware of how much company expenses is using each month". 'Management Organization for Postal Savings and Postal Life Insurance... too wordy! 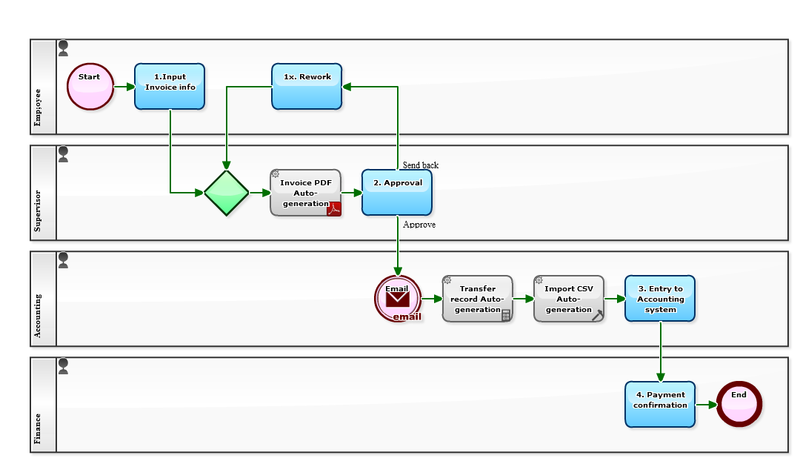 The following two Workflows are schemes that an applicant makes application, and administrative accepts and confirms. Everything will be completed online. "Enter the official company name!" 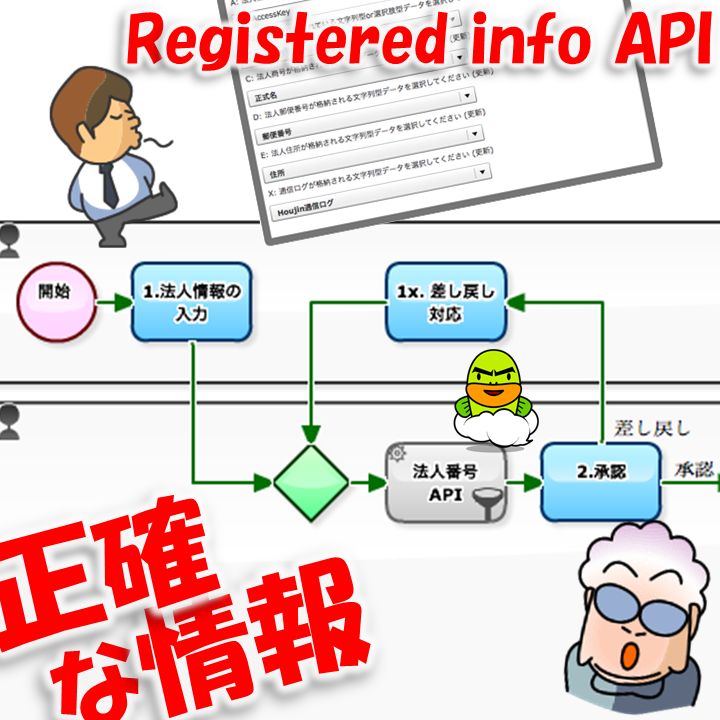 Since October 2015, Japanese government (National Tax Agency) has allocated "Corporate Number" to each and every enterprise in Japan. There, "official company names" (trade names), etc. are strictly managed. 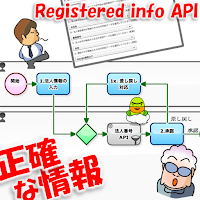 And Web-API that can be used free of charge has also been operating. That is almost an "infrastructure", so you have no choice not to use it. The following Workflow is a scheme of automatic appending of "Customer code" and "Customer name" to SpreadSheet, by entering new customer information. Although it takes a little labor, "official company names" are secured by entering "Corporate number". 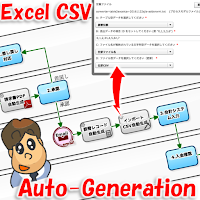 It has a very significant meaning that it will relieve you from "name-based aggregation" and "data cleaning". Yes, it will keep "big data" from being ended up in being "big noise-data".